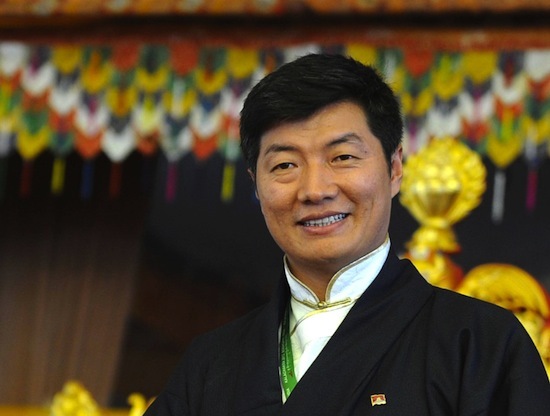 (TibetanReview.net, Apr29, 2016) – The Election Commission of the Central Tibetan Administration at Dharamshala, India, on Apr 27 announced the results of the Tibetan General election for which final polling was held on Mar 20, confirming the re-election of 48-year-old Dr Lobsang Sangay as the Sikyong for a second term. He won 33,876 of the total number of votes (57.08 % of the total) compared to 24,864 won by his rival Mr Penpa Tsering. The Sikyong is the political leader of the Tibetan people and the executive head of the Central Tibetan Administration. The total number of registered voters was 90,377, with 59,353 having voted in the Sikyong election and 58,615 in the Tibetan Parliament-in-Exile election. The election commission also announced the results of the 45-member Tibetan Parliament-in-Exile. The parliament has 10 members from each of the three traditional provinces of Tibet; two each from the four major schools of Tibetan Buddhism and the pre-Buddhist Tibetan religion Bon; two each from the Tibetan communities in North America and Europe and one from the Tibetan communities living in Australasia and Asian countries other than India, Nepal and Bhutan. The U-Tsang MPs to the 16th Tibetan Parliament in Exile are: Ms Tenzin Dhardon Sharling, Dhondup Tashi, Acharya Yeshi Phuntsok, Ms Dolma Tsering, Pema Jungney, Ms Namgyal Dolkar Lhagyari, Ms Samten Choedon, Dawa Phunkyi, Dawa Tsering, and Migyur Dorje. The Domey MPs to the 16th Tibetan Parliament in Exile are: Thupten Lungrig, Tashi Dhondup, Ms Tsering Lhamo, Ms Yeshi Dolma, Gyarig Thar, Lobsang Choejor, Dhondup Tashi, Ratsa Sonam Norbu, Karma Gelek, and Ms Tsering Youdon. The Dotoe MPs to the 16th Tibetan Parliament in Exile are: Ms Juchen Kunchok Choedon, Ms Yangchen Dolkar, Serta Tsultrim, Dorjee Tseten, Youdon Aukatsang, Kunchok Yarphel, Pema Delek, Lobsang Dakpa, Ngawang Tharpa, and Lobsang Yeshi. The Nyingma MPs to the 16th Tibetan Parliament in Exile are: Khenpo Sonam Tenphel and Khenpo Jampel Tenzin. The Kagyu MPs to the 16th Tibetan Parliament in Exile are: Ven. Kunga Sotop and Ven Tenpa Yarphel. The Sakya MPs to the 16th Tibetan Parliament in Exile are: Lopoen Thupten Gyaltsen and Khenpo Kadrak Ngodup Sonam. The Gelug MPs to the 16th Tibetan Parliament in Exile are: Atruk Tseten, and Gowo Lobsang Phende. The Yungdung Bon MPs to the 16th Tibetan Parliament in Exile are: Geshe Monlam Tharchin and Bara Tsewang. The North America MPs to the 16th Tibetan Parliament in Exile are: Ms Pema Chagzoetsang and Tsewang Rigzin. The Europe and South Africa MPs to the 16th Tibetan Parliament in Exile are: Thupten Wangchen and Samdho Jampa Tsering. The Australia and Asia (other than India, Nepal and Bhutan) MPs to the 16th Tibetan Parliament in Exile is Ms Kyinzom Dhongdue.